KUALA LUMPUR: Malaysia is reportedly all set to request Pakistan for the extradition of a terror suspect who was detained by the Pakistani security forces last week for trying to smuggle firearms and ammunition from Pakistan. 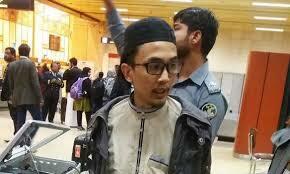 On December 23, 20-year-old Malaysian national, identified as Al Muhd Alfie Kqhyriel, was arrested at Jinnah International Airport in Karachi while trying to board Thai Airways flight TG342 to Bangkok. The security personnel confiscated four pistols, eight rounds of ammunition and 70 bullets from his possession. The items were concealed in his luggage and shoes. According to the reports, the arrested man had planned to use Thailand as a transit. Alfie, who is believed to be a member of the Islamic State (IS), is currently in custody of Inter-Service Intelligence for questioning. Speaking on the matter, Deputy Prime Minister of Malaysia Ahmad Zahid said that the extradition request will be made very soon through mutual legal assistance with Pakistan, so that the Malaysian authorities can carry out investigations according to their own law and security. While thanking Pakistan’s security authorities for informing Malaysia about the arrest, the deputy prime minister said that the Malaysian police were working with the Interpol to obtain more details about the arrest. He added that this matter will not be taken lightly and is something that will be monitored very closely by the Malaysian authorities. Earlier, Malaysian Police Chief Mohamad Fuzi Harun stated a possibility of sending its police officers to Pakistan or repatriating the apprehended smuggler. “His offence is very serious and we must discuss the matter further with our Pakistani counterparts,” Harun was quoted as saying. “There is still not much information about the suspect except for his alignment with Islamic State”, the police chief stated, adding, “His motive and plans for the weapons are still unknown.” Fuzi Harun further stated that Pakistani authorities were surprised by the arrest.